Though I’ve always been inclined toward a neutral, pared-down wardrobe (white is my favorite “color” to wear), I recently discovered Candace Marie, a fashion blogger whose vivacious style—while pretty different from my own—I just had to share. I stumbled upon a street style photo of her during the recent New York Men’s Fashion Week in a tunic layered over wide-leg jeans and accessorized with a hat, chunky necklace, and multicolor clutch. After a little digging, I found (with delight) her Instagram account—a treasure trove of inspiring outfits. Marie splices together different textures, patterns, colors, and shapes in a way that feels enduringly fresh and unique. She’s an example of the creative, experimental side of fashion that’s so important not to forget. See below for a roundup of her recent best outfits, and be sure to let me know if you’ll be snatching a look from her playbook in the comments. Style Tip: Layer a miniskirt over a crisp shirtdress. Style Tip: Add a touch of drama with a floor-length floral dress. Style Tip: Layer a fringed jacket over your favorite sundress for an unexpected update. Style Tip: Find a jumpsuit or romper in a lightweight denim fabric, and style it with a pair of simple sandals. 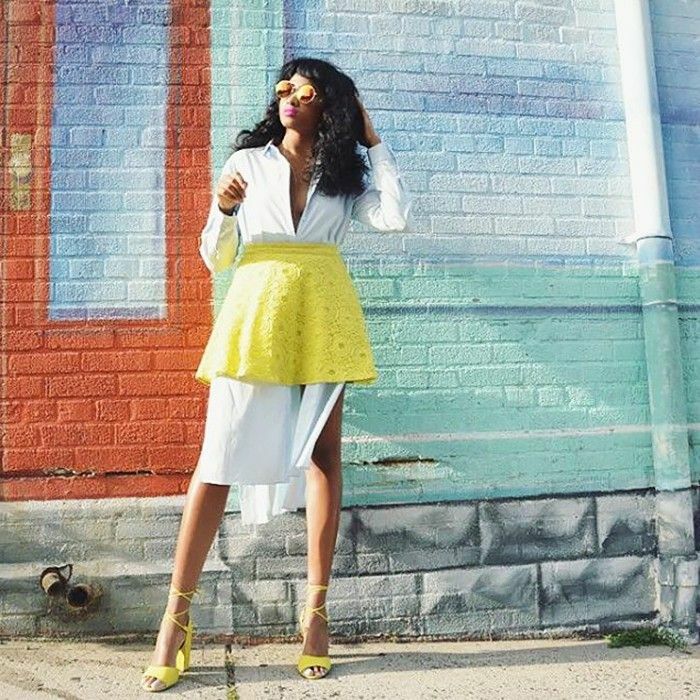 Style Tip: Incorporate a splash of yellow into your outfit. Style Tip: Contrast your striped trousers with a floral-print blouse. Style Tip: Toss an embroidered dress into your outfit rotation. Style Tip: Team a military-inspired jacket with fun separates like a baseball cap, furry bag, and leather trousers. Style Tip: Ditch your basic tee and try a graphic iteration instead. Style Tip: Never underestimate the power of a versatile hat. Style Tip: Jazz things up with a sequined dress. Style Tip: Freshen your office look with a blazer dress. Style Tip: Play around with vintage-inspired prints. Style Tip: Skip the skinnies, and go straight for a pair of wide-leg jeans. Want more outfit ideas? We just discovered a fashion blogger who only wears black and white, and her looks are so inspiring.